Hotel, golf clubhouse with changing rooms, bar, restaurant and pro shop. Golf facilities include a practice area and gof equipment is available for hire. 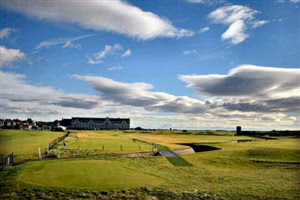 Carnoustie Golf Club was formally constituted in 1842 making it one of the ten oldest golf clubs in the world. The Carnourstie Golf Club is situated on Links Parade between the town and the coast. It comprises the world famous Championship Links Course plus two other very well respected and challenging local courses, The Burnside and the Buddon. The Championship course, with a Par of 72 but a Standard Scratch rating of 75, is generally recognised as the toughest test in Open Championship golf. The Buddon Links, the newest of the Carnoustie Golf club courses, designed by Peter Allis and David Thomas, opened in 1979. As would be expected from such a design duo, although a bit shorter than it's stable mates, this course is still an excellent example of top quality links golf. Visitors are welcome but forward booking is essential. I had the pleasure of playing here on a beautiful, calm, sunny day and as a consequence thought the course was absolutely lovely (even managed to birdie the Par 3). The first is a bit daunting with OOB all down the left and the starter and all the other waiting golfers watching your every move but once off from there the course winds its way along the coast and back again with enough distance between the fairways to give you a good feeling of space. The fairways were rolling and the greens big and fast (and well protected by bunkers!) and the rough was pretty light so the experience was a great one. If there was a downside to playing here it is that the clubhouse facilities were a bit 'stuffy', the practice facilities were only okay and the price was steep (but the course was still fully booked so they must have it about right). Would I go back - definitely!